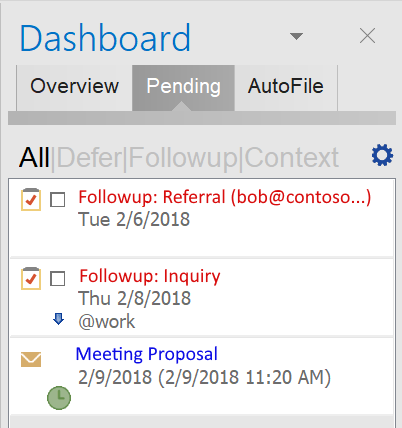 If you set a follow up message but do not set it to auto cancel it will not show up in the new dashboard. Posted by Dan on March 29th, 2018. Yes, non-automatic Follow up tasks are not included in pending by design, since those are manually managed tasks. 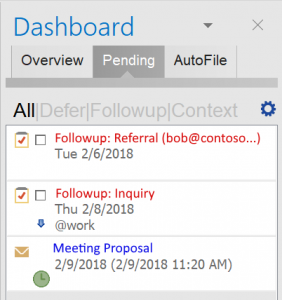 If you would like them moved to the Pending list, a way to do so is to set the option for Followup to set a category automatically, such as @followup. Then customize the Pending view to include @followup tasks. Posted by ClearContext on March 29th, 2018.